At Palola Dental, we want you and your family to have healthy and beautiful teeth throughout your lives. Dr. Palola and her team can help you accomplish this goal when you come in to our office for one of our many dental services. We provide treatments to prevent future dental problems. At Palola Dental, we want you and your family to have healthy and beautiful teeth throughout your lives. Dr. Palola and her team can help you accomplish this goal when you come into our office for one of our many dental services. We provide treatments to prevent future dental problems and maintain healthy smiles. 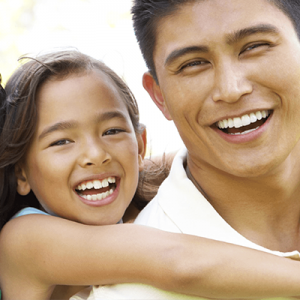 We offer a full line of general and family dentistry services to the great people in the Waipahu and Mililani area. We take care of our family dentistry and child patients so they understand long-term oral health and what they can do to take care of their teeth at home. Check out a few of our services for you and your family and children below. Dr. Palola’s extensive dental experience allows her to offer a wide range of dental procedures and treatments to her Mililani and Waipahu patients. If you or your child are looking for a family dentist for a specific treatment and services, the team at Palola Dental can help! See below. Tooth-colored fillings: These are needed for cavities. At Palola Dental, we use high-quality tooth-colored fillings so you won’t have to worry about mercury in your mouth or obvious fillings. The color blends with your natural teeth to keep your smile stunning! Teeth Cleanings: The best defense against cavities and other dental problems is a regular tooth cleaning every six months. Dr. Palola and her team will make sure your teeth are healthy with an in-depth cleaning, taking time to remove plaque and tartar build-up. A clean mouth prevents gum disease, tooth decay, and cavities, and we will examine your teeth and gums thoroughly to ensure a healthy mouth and prevent future dental issues. Tooth Extractions: Sometimes when a tooth is severely infected, the only option is to have the culprit tooth extracted. Our team can help your tooth extraction procedure run smoothly, ensuring your safety and comfort while visiting our office. Dental hygiene instruction: When you don’t know how to take care of your teeth, you should expect problems to appear. Our team instructs our patients on proper dental hygiene so you can keep your own mouth happy and healthy. We are always sure to teach our younger patients so they can maintain good habits for life! Invisalign: Although we are a family dentistry office, we are proud to offer an orthodontic treatment called Invisalign. If you want straighter teeth but would rather not deal with braces for two years, consider Invisalign! See the rest of our services here! Your family and children deserve healthy mouths and happy smiles, and we love treating you at Palola Dental. Whether you are considering teeth whitening, veneers, or implants, we’ve got you covered! Dr. Palola is proud to serve patients in the Mililani and Waipahu areas. Find out how to make your next appointment below. For a Children’s and Family Dentist Contact Palola Dental Today! If you’re in the Mililani or Waipahu areas of Hawaii, consider making Dr. Palola your family or children’s dentist. We promise to provide friendly service, thorough examinations, and excellent results! To contact our office, call us at (808) 678-3000 or request an appointment online. We can’t wait to meet you!